A blog to record Roger and Char's trips to India, Nepal and Thailand. The latest entries cover Roger's trip in August - October 2008. Roger lives in Portland, Oregon with his wife, Charlyn, and their cat who is training them to be better humans. On September 23 the owner of the Hotel Ratnagiri graciously took me on a tour of the Okayti Tea Estate. A short 20 minute drive from Mirik over some very narrow, rough roads revealed many acres of a tea estate with its numerous workers spread over several kilometers picking the tea. The tea plants have lovely small blossoms, which we never see in the final product. The tea estate borders Nepal, separated only by a small stream that people seem to flow back and forth across at will. I didn't see any soldiers or officials. Many Nepalis bring their products across the border via horse or donkey to sell them in India and return the same day. I've never given tea production much thought. What's to do? You pick it and dry it and put it in a box. Not quite that simple in real life, and certainly the scale of the process makes it anything but simple. The tea is of course picked, and gathered in a drying room where warm air is passed over and under it. It then goes through several stages of grinding and sifting until different degrees of fineness are segregated by a large shaking machine sorting the tea into plastic buckets, emptied by attentive tea workers. In fact all of the machines are large. This is purportedly the oldest tea making facility in Darjeeling area, and produces its own electricity and hot water for drying the tea. The strong smell of tea is everywhere and most of the workers wear masks to protect their lungs from the tea dust that covers every surface and is somewhat slippery. The final stage is a hand sifting in a large room. Never did find out how it gets into the packages. Oh well, maybe that will be revealed on another trip. On September 24, my next to last day in India this trip, Ngodup and I visited the shedra (monastic university) being constructed about 2 hours from Siliguri. The existing shedra is located in South India and is not practical because of the distance from Bokar Monastery, requiring many days travel to get back and forth. The new shedra is still under construction, but a lot has been accomplished in the last two years. The main building housing the main shrineroom, a Tara shrine, library with computer cataloging, monks quarters, Rinpoche quarters and quarters for the Karmapa is HUGE! The main Buddha statue in the shrine room is over 50 feet tall, and will be flanked by two slightly smaller statues. All of this under a huge roof with no internal supports, so everyone will have an unobstructed view of whatever ceremonies or teachings are held here. It is envisioned that the Mahamudra or Yidam seminars might be held in the 'smaller' Tara shrine that would easily accommodate a few hundred people. The 20+ acre complex is large by Indian standards and is located far from any major population centers. A very small village, a tea estate and military land form the boundaries of the site and assure that any development will be limited to one side, through which the road leads to the shedra from the main highway. 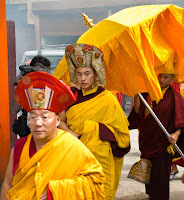 On September 15 Kalu Rinpoche, with Khenpo's blessing, gave the monks a day off to have fun. In monk terms that means only one thing, soccer. A tournament was organized and monks appeared in some pretty professional outfits. Reminds me of that excellent movie, "The Cup". If you haven't watched it, go rent it. Very warm and humorous portrayal of life in a Tibetan Buddhist monastery. The 3-year retreatants who just came out of retreat played the retreatants going into retreat. Now even if you've spent the last 3 years sitting on your behinds, you'd think that with Kalu Rinpoche as your manager, and Eric as goal tender, your team should do well. They lost 3-0. But a good time was had by all and the event attracted a lot of local spectators. In all there were 6 teams. They played 10 minute halves. On September 17 we visited Kalu Rinpoche's monastery in Sonada, near Darjeeling. The occasion marked Rinpoche's 19th birthday and his successful completion of the three-year retreat at Bokar monastery. Lama Tsang Tsing from Eugene, Oregon also attended and I caught a picture of him offering a kata to Rinpoche. Hundreds, if not thousands, of people attended this event; many of them local people who patiently waited outside held back by a phalanx of the larger monks. It was the longest line of people offering katas that I've ever seen. I could never have remained as patient as Rinpoche, accepting each kata and blessing the person offering it. After a nice lunch which was delayed until about 2:30 due to the large kata line, we returned to Mirik, missing the cake cutting at 6:30 pm; but I did get a picture of some parts of the cake before we left. When constructed, the cake read, "HAPPY BIRTHDAY RINPOCHE". September 12 we ventured to Ralang in Sikkim to visit H.E. Gyaltsab Rinpoche's monastery. The road to Ralang was an adventure in itself. What normally takes 4 hours, required 8, so it was a long day. Some of the delay was due to an overturned army truck and processing our visas at the border. While Sikkim is an Indian state, it's proximity to China requires a special permit to visit. The rest of the delay was simply the condition of the roads after monsoon. Some were muddy; others had small rivers running across them. At points there were spectacular views (and drop offs). The retreatants offered a thanksgiving offering for all the empowerments and techings offered by Rinpoche. We were also privileged to attend the Red Crown ceremony performed by Rinpoche. We stayed at a wonderful little "resort" called the County Inn, which I believe was intended to be the Country Inn. The accommodations were very comfortable at 800 rupees per night and it offered spectacular views of Mount Kunchenjanga, the third highest mountain in the world. How would you like to wake up to this every morning (see picture)? The trip back was quicker and we stopped at the statue of Guru Rinpoche, which is in the middle of nowhere, but quite spectacular. Kalu Rinpoche and the retreatants offered a puja and we all enjoyed the beauty of the statue, though it was being refurbished, hence the bamboo scaffolding. Yesterday, September 9, was a very special day. Caren Ewart and I traveled all, the way to Mirik, India to see Caren's son, Eric Triebelhorn, emerge from a traditional three-year retreat at Bokar Monastery. He and 20 other retreatants, including Kalu Rinpoche, participated in ceremonies that officially ended their retreat which started at about 3:00 AM and lasted until just before noon. We were lucky enough to join the retreatants in the retreat center at 6:30 AM. Sometime later, Caren got to get close to Eric for the first time in over 3 and one-half years. See the picture. During this time we were able to offer katas and offerings to each of the retreatants and Kalu Rinpoche and Khenpo. I brought pictures of Ben Barta's Sukkha Siddhi thangka from Char and I for each of the retreatants. OK, it was Char's idea, but Ben and I did all the leg work. Snacks were served in trhe retreat courtyard and there was a procession of all the retreatants, led by Khenpo Lodro Donyod, the abbot of Bokar Monastery. They circumambulated the monastery and then everyone gathered in the main shrineroom for prayers and a long life offering to Kalu Rinpoche. The traditional sweet rice and butter tea were served. Caren has yet to try the butter tea, but I'm working on it. At lunch, some of Eric's first words were, "There sure are a lot of people." That was repeated several times throughout the day. He plans to come out very slowly and spent the rest of the day in the reteat center. Maybe he will venture part way down the hill to Tsewang's house today for dinner. After lunch, I got a ride down the hill to my hotel on the back of Karma's motorcycle, artificial knees and all. On the 12th we head for Gyaltsab Rinpoche's monastery in Ralang, Sikkim, with all of the retreatants who will offer thanksgiving to Rinpoche for his empowerments and teachings during the retreat. We will spend a full day there on the 13th and return on the 14th. On the 17th we plan to attend Kalu Rinpoche's birthday and enthronement ceremony at Sonada Monastery near Darjeeling. We had spectacular thunderstorms last night about 3:30 AM. Woke me up and I enjoyed the view before going back to sleep. This is the tail end of monsoon, but we've been lucky because there hasn't been much rain while we've been here. Arrived in India several days ago, but Internet access is dial up only and spotty at best. I came down the mountain from Mirik this morning to Siliguri to get a visa to visit the state of Sikkim. Plan to go to Gyaltsab Monastery for some ceremonies for the three-year retreatants that get out on September 9, tomorrow. So I'm enjoying a wireless connection at the Hotel Cindrella, arranged by my friend Ngodup. Not to mention the air conditioning. It's very warm down here compared to Mirik. Will be headed back to Mirik in a few hours. Had a good trip from Kathmandu to Mirik via the small airport at Bhadrapur. Hired a taxi that we shared with a Nepali gentleman who lived about halfway to the Indian border. Got out and walked through both sets of Nepali and Indian customs/immigration and then hired an Indian taxi to take us to Mirik. A fun trip, complete with flat tire. See the picture. But we arrived safely after a 4 and one half hour journey. The weather in Mirik is better than I expected. It's the tail end of monsoon, but it hasn't rained very much and yesterday was very sunny and no rain. So far no rain today, and I hope it holds for our journey back up the mountain. During a 90 minute car ride we go from about 300 feet in altitude to a little over 5,500 feet. It gives "up" a new meaning. There will be ceremonies starting about 6:00 AM tomorrow morning for the end of the 3-year retreat. Then on the 13th we will go to Gyaltsab Rinpoche's monastery at Ralang in Sikkim. Will return to Mirik on the 15th and then go to Sonada monastery near Darjiling, to celebrate Kalu Rinpoche's birthday and enthronement on the 17th. Caren returns home the following day in Michael Conklin's care. She's been great to travel with. Traveling in this part of the world requires a lot of flexibility and the ability to just go with the flow when things don't go as planned. Caren has been fun to be with. Some (many) roads in Nepal are not passable in Monsoon; and we're experiencing the last rains during our visit. So I knew the road to Pullahari could be difficult; but I wasn't prepared for the sea of mud that confronted our taxi, even on this sunny day. I took a picture on the way down; I was too worried whether we would make it on the way up, to do anything but pray our way through each mud hole. Pullahari is an amazingly beautiful monastery, with spectacular views of the Kathmandu valley. Caren and I listened to students from a local Tibetan School chant long life prayers for His Holiness Dalai Lama and others. We had lunch at the cafeteria, enjoying the views and the cool breeze as we ate our spring rolls and polkhara. Caren bought some candy and gave it to some little monks. A kind monk showed us the library with its beautiful parquet wood floors. We also spent some time in the shrine room housing Jamgon Kontrul's kudong (body). Tonight we lit candles near the stupa. Caren lit them for the completion of Eric's retreat and I lit them for Char's retreat, to remove all obstacles from their paths. Copyright 2005-2008 Roger Edwards. All rights reserved.